Keywords - called hashtags - such as 'Iran' and 'Mousavi' were added to its messages so people searching for those subjects would see the firm's adverts. The retailer has said the use of the hashtags was "not authorised", but declined to say who was responsible. 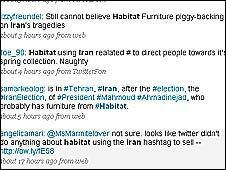 Contributors to Twitter posted messages claiming Habitat should be "ashamed" and saying it was "piggy-backing" on the political situation in Iran. One of the controversial messages - called tweets - which appeared before being removed by Habitat, read: HabitatUK: #MOUSAVI Join the database for free to win a £1,000 gift card. In a statement Habitat said it had "never sought to abuse Twitter". One online communication expert told the BBC it was hard to imagine how such a "serious misjudgement" could have happened. Habitat added: "We would like to make a very sincere apology to any users who were offended by last week's activity on Twitter. "The top 10 trending topics were pasted into hashtags without checking with us and apparently without verifying what all of the tags referred to. "This was absolutely not authorised by Habitat. We were shocked when we discovered what happened and are very sorry for the offence that has been caused." The business said it was "totally against" its communications strategy, that it had removed the content and would ensure it did not happen again. "What they have done is extraordinary, that they would even risk something like that. "This could not have led to anything other than a consumer backlash. "The bottom line is that it was a serious misjudgement. They have used a political and human situation that many people are concerned about, to market their products and services and that is not right." He added that marketers had to be particularly careful about the way they used social media - more so than they would be in any other form of media - because consumers were more "in control". "Advertising in social media can be like gatecrashing a party. People who use social media are much less tolerant to have their conversations interrupted by advertisers. "The art is in being able to tap into those conversations without alienating people."